Shooting glove are for general shooting sports and for search by cops. 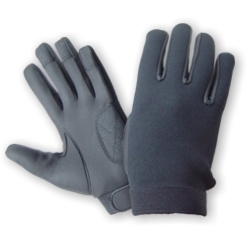 These glove specially designed for cops with toughtek® material at palm and fingers tips to hold the weapon properly. Designed as search and duty glove, it provides the dexterity and protection law enforcement officers need for everyday duties in the field. The front hand is made of fine quality Sarino® water resistant material and that do not absorb the sweat and make your hand cool. o Fine quality water / moisrure resistant Sarino®. o Neoprene back for dexterity and comfort. o Toughtek® grippe at palm side and fingers tips. o For all types of shooting and search.